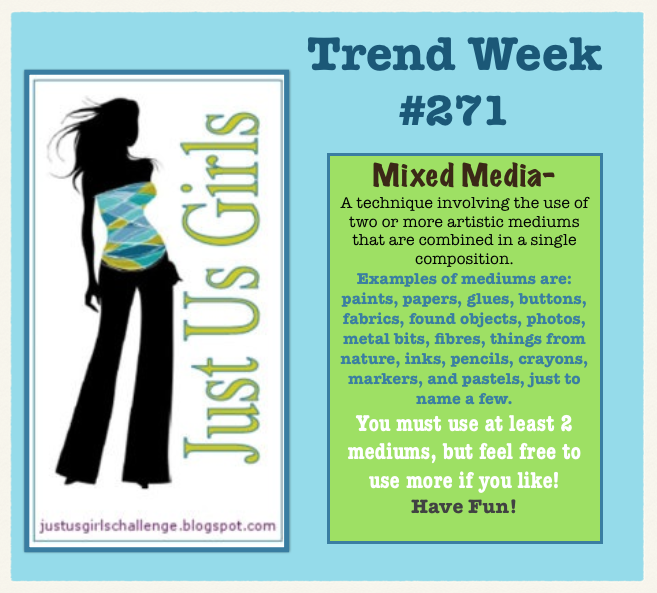 It’s Trend week at Just Us Girls and have we got great one for you! Mixed media! Now don’t be scared it really can be as easy or complicated as you want to make it. Check out the graphic for some explanations and requirements. It’s really late and this post goes live in a few minutes so I am going to explain my card rather quickly! First, I took my watercolor SU pen and 3 colors and randomly colored my watercolored paper. Then I took my Script stamp and some Brown Gina K ink and stamped on my watercolored paper. Next, I took my glossy SU cardstock and Verve heart stamp and stamped and heat embossed my hearts with clear embossing powder. Then took the same 3 colors of SU ink and colored over the hearts and then wiped the cardstock so the hearts would appear. I assembled my card and added a few (Verve) small heart stamps and the arrow and I Love You (from Recollections). Wasn’t happy with the look I was trying to achieve so I decided to give the card a white wash with some Gesso. Then I took my Gina K Brown ink and inked up some of the edges and front of the card as well. I got carried away with the brown and came back with my original 3 colors and my watercolored brush and lightened it up in a few places. Well, that was probably more info then you even cared to read, but since it was Mixed Media challenge I thought an explanation was in order so you can see all the steps I actually did to achieve this look. I so enjoyed the process! I would also like to welcome Lee Ann Barrett as our Guest Designer this week at Just Us Girls. Please come on over an join us and see what the talented team did with this challenge. Who knows if you win our Chic of the Week you may also be chosen as a Guest designer with us in the future! 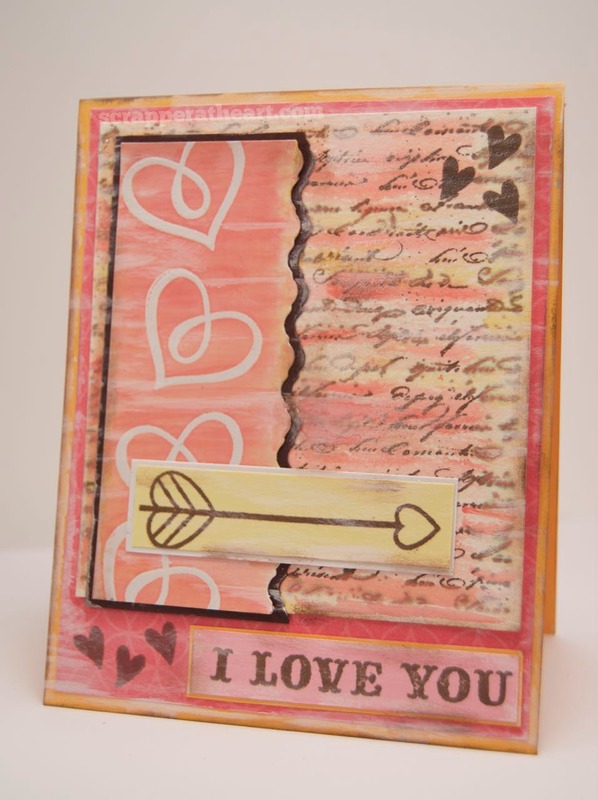 Categories: Cards | Tags: Card making, Cards, Love card, mixed media, rubber stamps, stamping, Trend, Valentines Day | Permalink. Very pretty. I love your card. Thanks for the info on how you did it. It seems I am usually your first comment-er, Nancy. 🙂 This card looks great. I have been afraid of multi-medium because it looks so artsy, not that I”m not, but I will definitely be trying this just to get my feet wet. FYI: Your link to Just Us Girls isn’t working. You are the best! Thanks for the heads up and your visit and sweet comment! Awesomeness! All that layering looks terrific! Lots of pretty colors on this one and lovely design! Well done! Lovely colour combination and mixed media effect. Fabulous card Nancy. Hi Nancy! Thanks so much for the warm welcome; I am thrilled to be designing with you talented ladies this month! Love your unique card; the color combo is wonderful! Amazing! Love the colors and the steps to achieve this beautiful look. Great blending of mediums on this.